ACC-EX column type grinders deliver all the performance, precision and dependability as the ACC-DX Series plusa new degree in convenience. There easy-to-use Manual Data Input (MDI) control system simplifies set-up, change-over and boosts productivity. Vee and Flat table ways assure true tracking and greater table load support. Teaching Function for easy set-up. 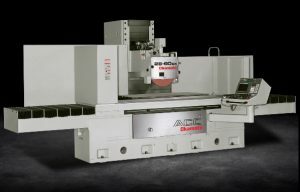 Choice of automatic grinding cycles – Work/Chuck datum, Shift-Plunge, Simple Dress Invalid Cycle. Minimum Crossfeed increments as fine as 0.00005″.